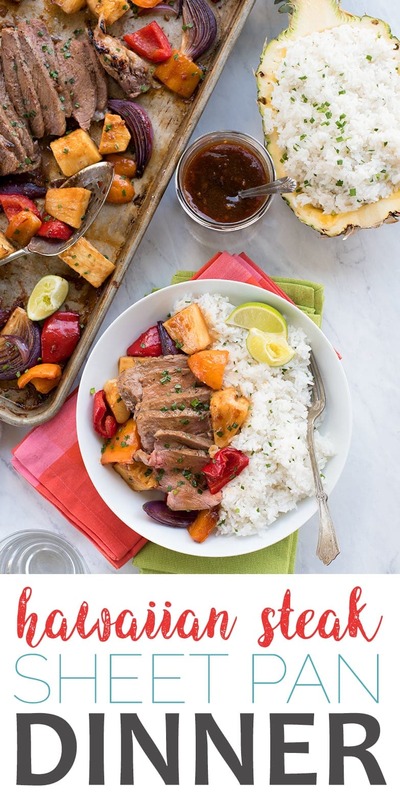 You have to try this sensational sheet pan recipe for Hawaiian Steak with sweet peppers and pineapple! 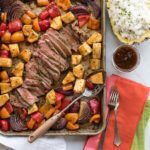 Discover how to make this easy Hawaiian Steak Sheet Pan Dinner that’s cooked perfectly every time! 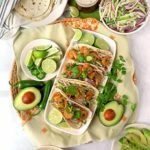 Great for meal prep and busy weeknights! 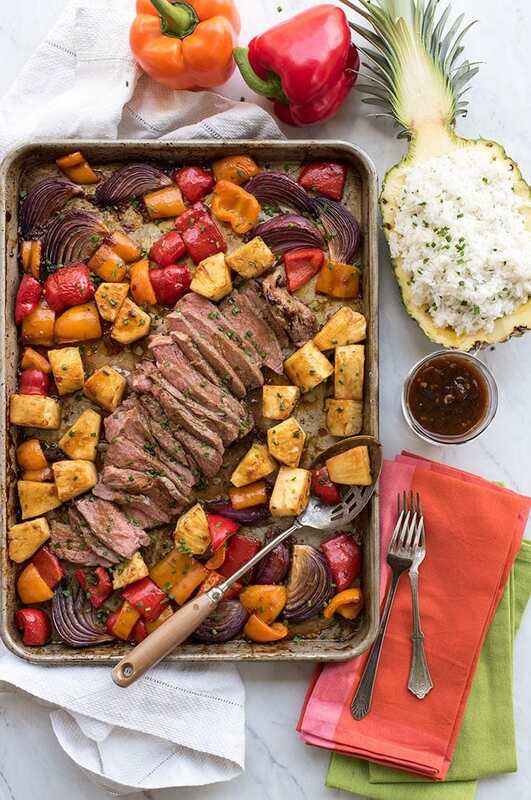 Isn’t this Hawaiian steak sheet pan dinner so pretty? Look at all the color! This genius flavor combo was the brainchild of my husband, Kevin (AKA the weeknight dinner whisperer). 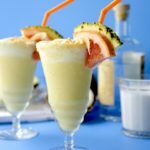 Back in the Spring of 2017, I must have been craving frozen pineapple because I created this PINEAPPLE ORANGE CREAMSICLE SMOOTHIE recipe and this PROSECCO PINEAPPLE SORBET FLOAT cocktail. So, of course we had leftover pineapple and juice in the fridge and it was Kevin’s turn to make dinner. Well, we always have steak, peppers and onions on hand so he made a simple stir fry that tasted so delish! He said it was inspired by our favorite selections at Pei Wei, caramel chicken and ginger broccoli with steak and the flavors that would be created by them mixing together on the plate. 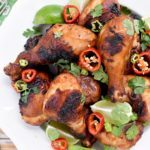 I was so wowed by the recipe, I made him write down the ingredients so I could share it on the blog. Well, if you know me, you know I can’t leave well enough alone, LOL! Although it was an awesome stir fry dish, I got to thinking about sheet pan dinners and how to prep this recipe on the weekend for faster weeknight meals. The secret was in the sauce. Just like this amazing ASIAN BAKED SALMON recipe, this savory and sweet sauce can be prepped in advance and frozen. That way you can get dinner in the oven in the time it takes to cut up some pineapple, peppers and onion! Tastes like a stir-fry but has the hand-off time you need on a weeknight! 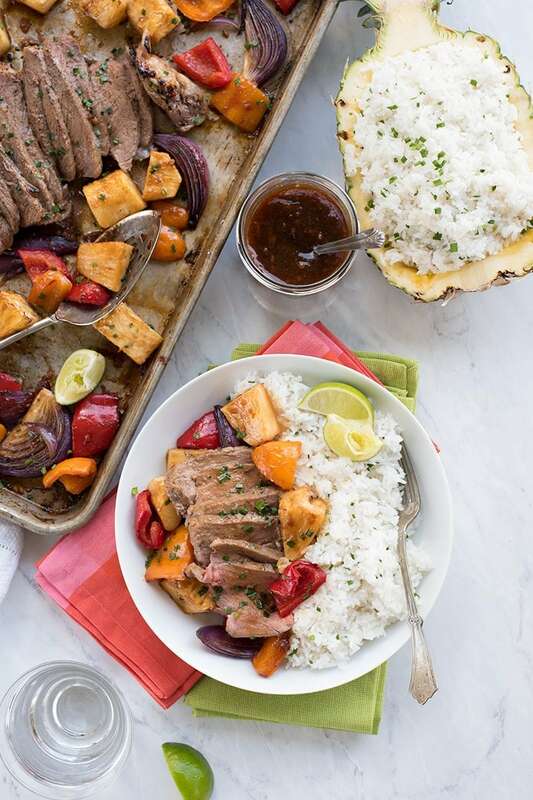 But the best part of this method is it creates the most tender, succulent Hawaiian steak! It’s juicy, sweet and salty and almost melts in your mouth! We bake the steak whole, one of those nice, thick New York strips, and it turns out perfectly. But as I’ve said before, you’ve got to have a GREAT thermometer. Nothing ruins a great steak like overcooking it! So we pull our steak out at about 130F and let it rest so all those succulent juices reincorporate into the meat. Then we slice and serve all this pineapple-y goodness over rice. Typically we’ll garnish this Hawaiian steak sheet pan dinner with cilantro, but the chives in the herb garden are fresh and bright green right now, so that’s how we finished it off this week. There are so many things to LOVE about this exceptionally easy recipe! It’s flexible to your lifestyle, very few dishes to do and it’s casual but tastes foodie. I think this recipe is 99% foolproof, but scroll down to get our tips for dinner success below. Repeating myself here, but an instant read thermometer is your best friend in the kitchen. Steaks come in all shapes and sizes, so it’s the best way for home cooks to know when to stop cooking and start resting your meat. We usually slice and plate everything in the kitchen, but if you do things family style and want to return the steak to the cookie sheet, know that a hot sheet pan will continue to cook the meat… so aim for about 5-10 degrees lower than your desired temperature. Learned this the hard way taking these photos! Oops! Don’t use frozen pineapple…it will make your dinner watery. 2 cups of pineapple is equal to half a pineapple. If you’re feeling fancy, you can scoop out the other half of the pineapple for a rice bowl and freeze the remaining fruit for smoothies. I freeze my sauce in jars so I can easily defrost the sauce in the microwave or in hot water. Always make sure to leave head room in the jar for expansion! I love this dish for weeknights because there's plenty of hands off time. To speed things up, I make the sauce in large batches and freeze it in jars for later. In a saucepan or skillet, combine garlic, ginger, rice wine vinegar, soy sauce, brown sugar, pepper flakes and 6 oz of the pineapple juice. Bring to a simmer and cook until the sauce begins to thicken, about 10-15 minutes. In a small bowl, stir together the cornstarch and remaining pineapple juice and add it to the pan while stirring constantly. Bring to a gentle boil, cooking until the sauce is thick. Lightly oil a sheet pan and place the steak in the middle. Place the veggies and pineapple around the steak and baste everything with the Hawaiian sauce. Bake in the top of the oven until steak reaches 130F, about 20-25 minutes. Place steak on a cutting board and cover with foil. Return the veggies to the oven and bake another 10 minutes. After the veggies are done, thinly slice steak, garnish with herbs and serve with rice. 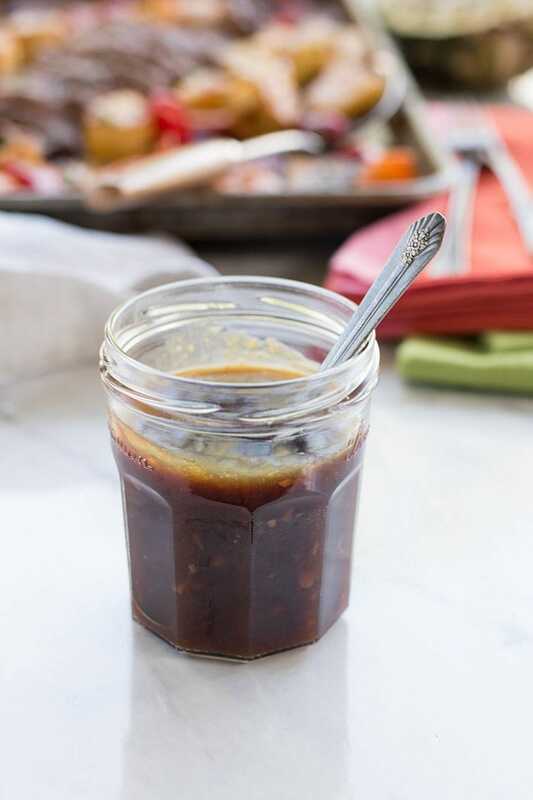 The sauce can be made ahead and stored in the refrigerator up to one week or up to 3 months in the freezer. One sauce recipe makes about one cup of sauce. I recommend against using frozen pineapple, as it tends to get watery upon thawing. 2 cups is about half a pineapple, so I find it most economical to buy a whole pineapple and use half for this recipe and freeze the rest for Pineapple Orange Creamsicle Smoothies. Congrats on your wedding! You should totally get your pineapple on in preparation for the honeymoon. Hope you have a GREAT time! I love sheet pan dinners, especially for busy weeknights. All of these flavors sound amazing and the dinner looks beautiful! This is SUCH a great casual dinner party idea! I’m totally dying over how you styled that rice in the pineapple. PS: your photos are gorgeous! Anne, thanks for the compliment. I love photographing food. I’m glad you like looking it it! Pineapples are super fun to style, they beg to be ‘boats’. Such a handy tip with freezing the sauce, really convenient too! My other half is going to love this! Anna, making and freezing the sauce makes the SUPER easy to have anytime. It cuts the ‘active time’ on this recipe down a ton. 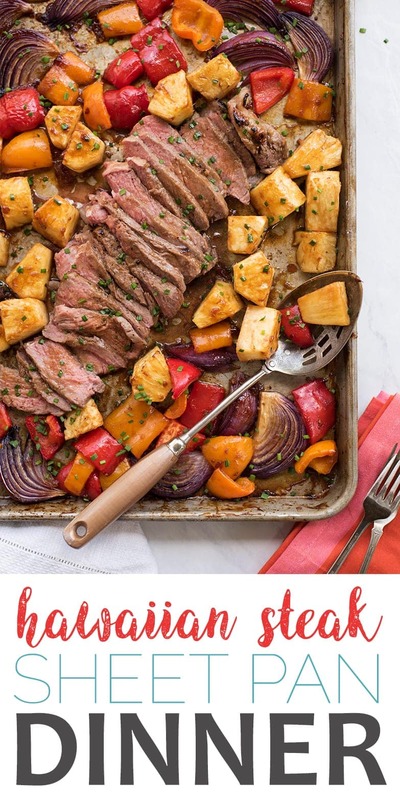 I love sheet pan dinners so simple easy and quick to make. As a working mom, such recipes are time and lifesavers. Saving this for later. Here’s to working moms! You rock out that weeknight meal Veena! This looks totally amazing! 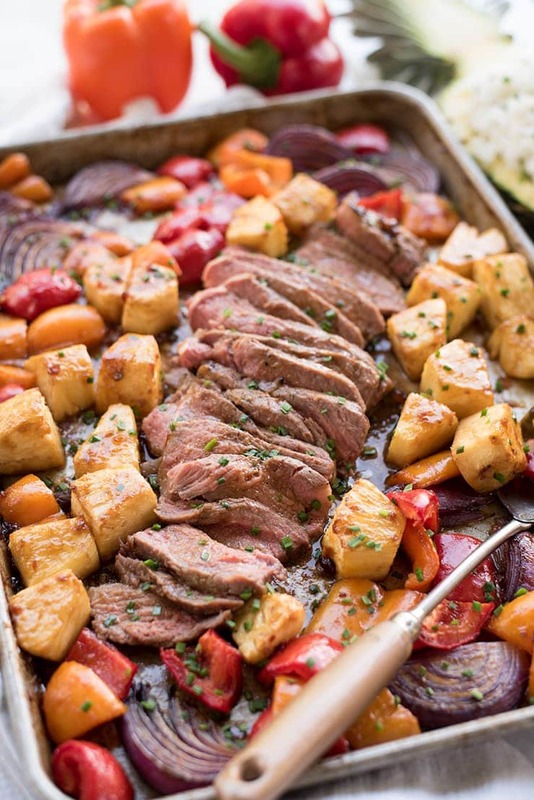 I love a good sheet pan meal, especially one with such fantastic flavors!!! Thanks Jenni. We love it too. Its so nice to have a hands off weeknight meal like this. Hope you like it too. I love that nickname – the weeknight dinner whisperer. HA! 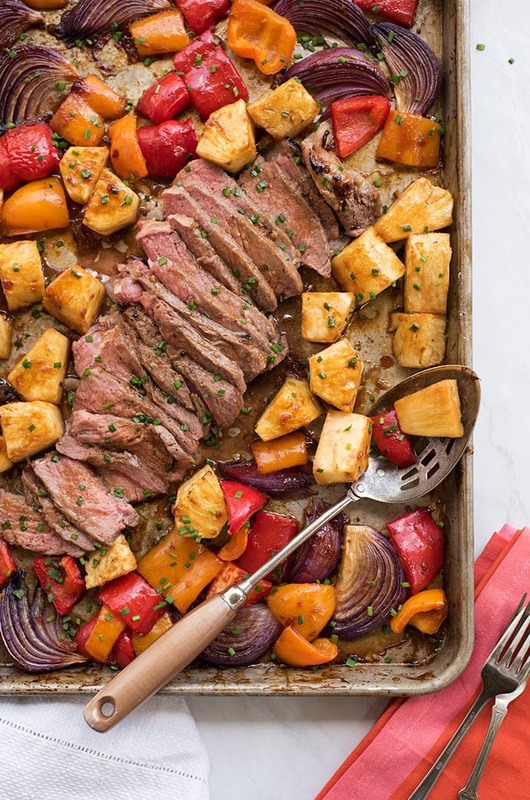 This looks like a fabulous meal – sheet pan recipes are so handy for busy weeknights. And the mix of sweet pineapple with meat is always a hit in my house. Yum! Thanks Ashley! It’s great to have a hubby that can help get a weeknight dinner done, so I can focus on ‘blog food’. Hope you like it as much as we do! This must be definitely so flavorful,with all the veggies,fruits together with the meat in there. Prasanna, it really is I love how sweet but fresh it is. Thanks Karyl! The pineapple is so good….sweet and tangy! Sheet pan dinners are the best!! This is such a gorgeous combination of ingredients and colours, love it! Aren’t the colors great? Hello antioxidants!!! this takes me back to great memories of luaus in Hawaii! And I love your sheet pan, looks like it’s been well loved. I’m going to try this for Father’s Day, wish me luck! Hope the dads in your life love it Cindy! And yes my pan is well loved! I’ve had it for 20+ years? From back in the days before all sheet pans were enameled. This looks amazing! Super big flavors and a great way to wake up dinner time. I love all the helpful hints too! Thanks Heather! Hope the hints make your dinner spectacular! Hello, delicious! I am a fanatic for sheet pan meals. You created a great one. Wonderful flavors and a well-balanced meal! Love that the leftover pineapple can be used in your pineapple orange creamsicle pops too! 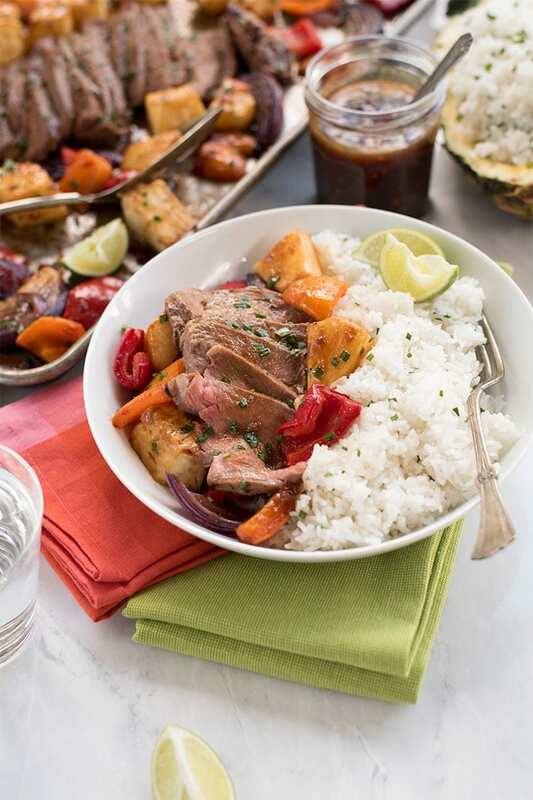 Aren’t sheet pan dinners great? Hope you love it Eileen! I love the different flavors your using with this! I never thought about going this route and it looks really good! Hi Nicole! Hope you give the recipe a try! Hi, I love this recipe. Mouth watering photos. I have to try it for my kids. Thanks Prasanth! I think your kids will love this recipe!